I am ecstatic to announce that I now offer these below classes that you can take online! How to Sell on Etsy: Pricing, Marketing & Photography - NEW! Etsy is an international platform for crafting talents to trade their goods, virtual files, vintage items, supplies. You can find a multitude of items on sale at Etsy, from one of a kind wooden beds to 2mm Swarovski crystals beads, and everything in between. With multi-lingual platforms and selling interfaces, your items are visible to customers worldwide. So… how do you harness the power of Etsy? I will walk you through how to set up an Etsy store, listing an item, and then fine tuning your brand to captivate an Etsy customer and achieve the ultimate goal of a sale! We will also cover after sales care, maintaining customer relationships, keeping track of inventory, cost and additional fees.Connecting all the personal success tips and Etsy tools, we will come up with a solid plan to launch your Etsy store. Do you have a fantastic design that you wish to offer to the world, but are limited to one single size? Do you wish to understand what separates the casual designer from a fashion design brand? Grading is a specialized skill set that can help transform your base style into multiple sizes. In offerings wider size ranges can doubles or triple your targeted customers. In this class you will learn the steps in to developing graded measurements and expand and reduce pattern shapes into different sizes. This will enable to capture wider audiences, and maximize your earning potential! This in depth web seminar will take you through the industry standard grades and grading methodologies. 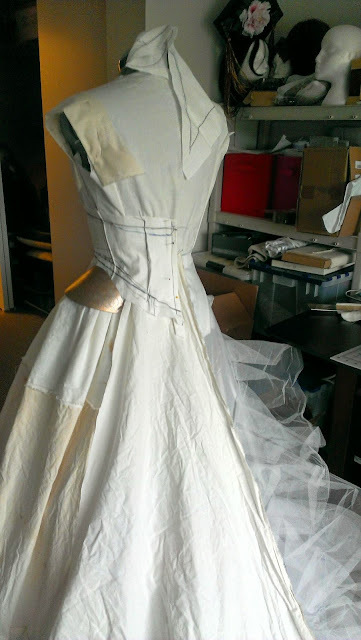 All you will need is the base pattern, pattern making rulers, pencil, tape and paper. We will start by understanding measurements that are critical to grading, with emphasis on maintaining the same fabulous look and beautiful fit. 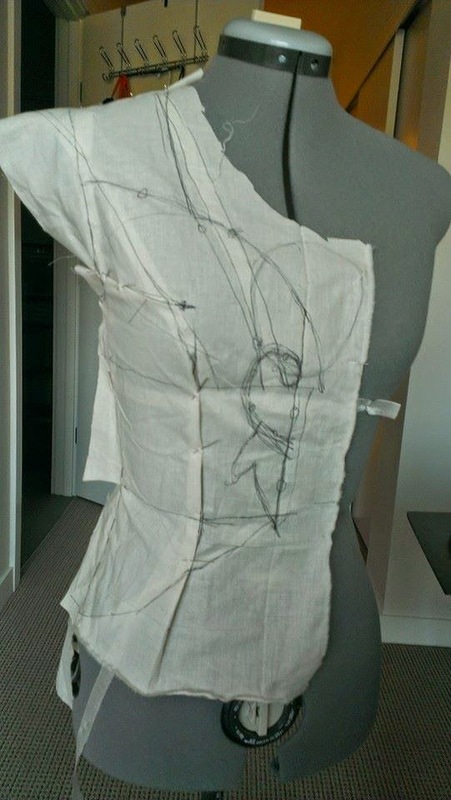 Next, we will roll up our sleeves and learn about how to easily, quickly and accurately draft our graded patterns. Throughout the class, I will dispense professional tips and best practices that will enhance each topic. At the end of the class, you will have your own set of graded patterns and a tool box full of useful tools to establish your brand’s look! Give your favorite summer jacket a makeover, and make it 3 season appropriate! Add flair and warmth to your coat in this class! You will learn the creative steps to design and make a removable and reversible coat liner! This fun web seminar will take you through the steps in drafting a liner pattern from existing coats, fabric selection, appropriate loft material, and finishing designs.You are only steps away from creating the perfect addition to your wardrobe. 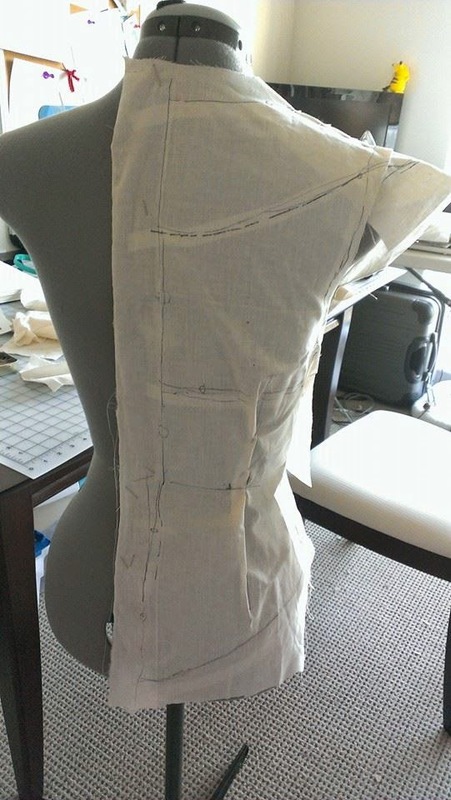 We will start by going over basic details on jacket types, liner fabric selections, sewing techniques for thick material, patterns, key points in adding loft, and lastly, quickly finishing designs details. Throughout this web seminar, I will dispense professional tips and best practices that will enhance each topic. At the end of the class, you will have all the knowledge you need to create your own fun removable, and reversible liner! 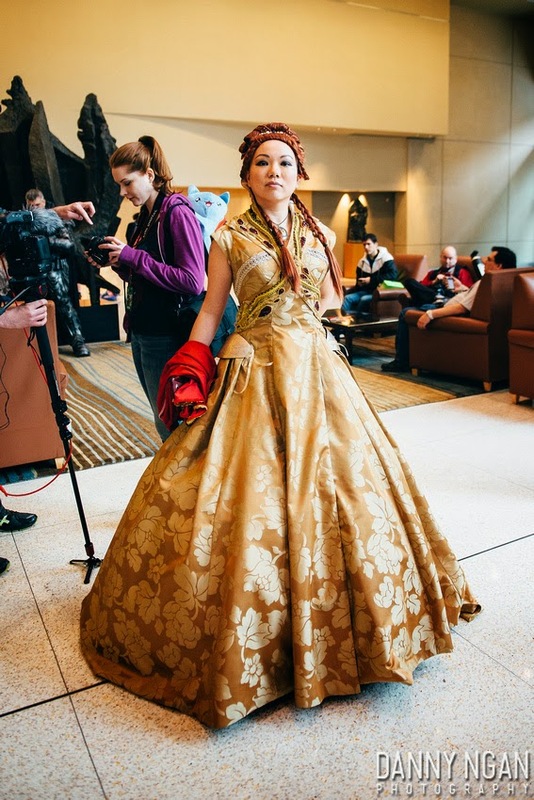 Intrigued by Cosplay? Not sure how you go about developing your unique character? 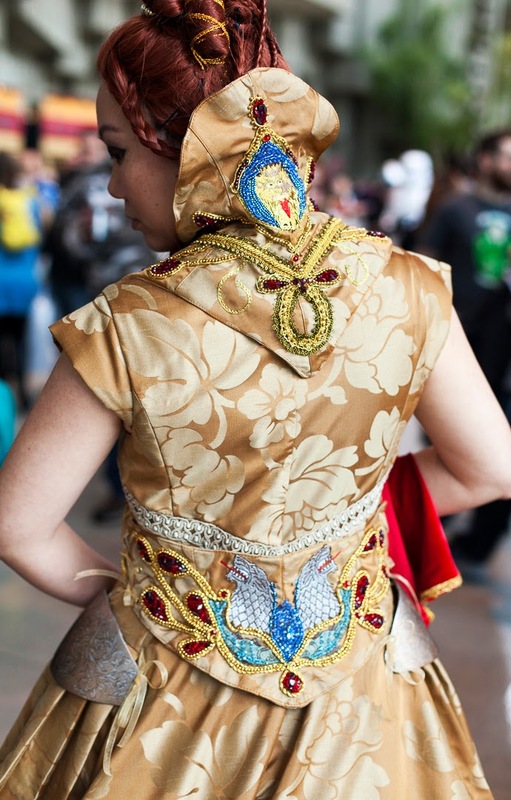 This class will walk you through the process – from conception to realizing the perfect costume for you! 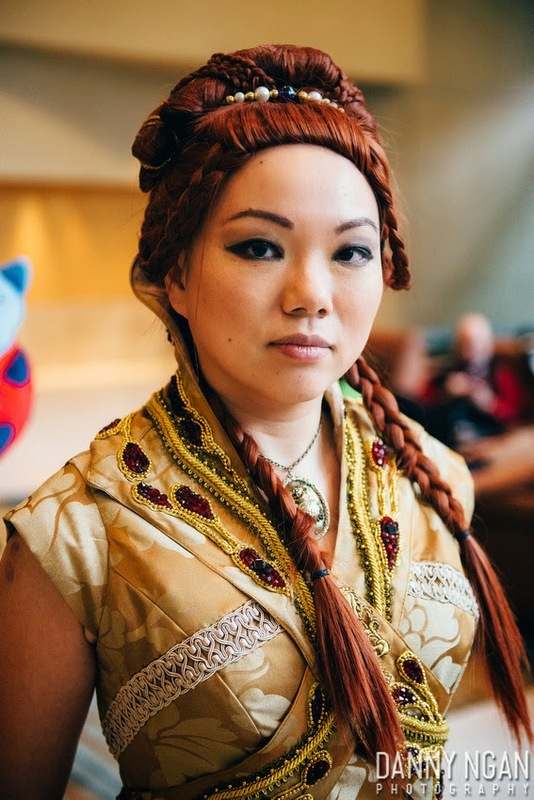 Anna will share valuable tips for patternmaking, embellishing and bringing our character to life. To say I'm thrilled about this is a colossal understatement. Gigantic. 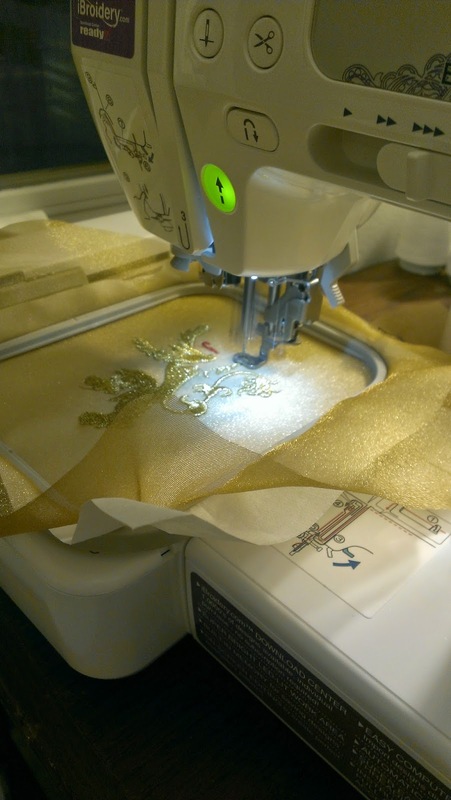 After many months of hush-hush, hard work, and anticipation, the cat is finally out of the bag: I am collaborating with SVP Worldwide (parent company of Singer, Husqvarna Viking, and Pfaff sewing machines) to take part in The Sewing Party - an online celebration of all things sewing. 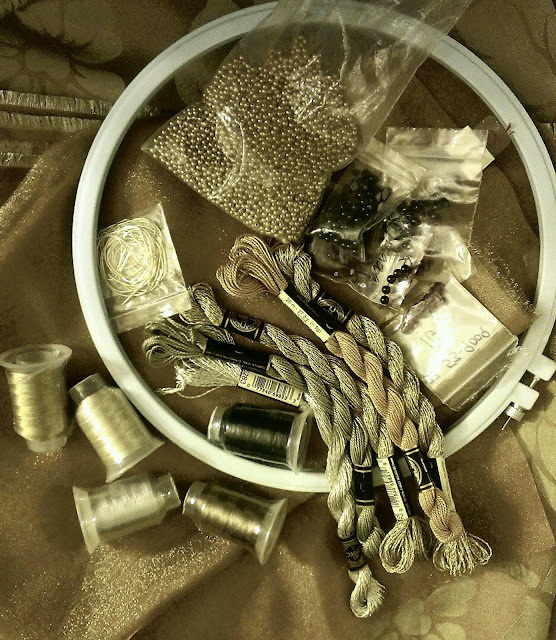 “The Sewing Party” is the first ever online-all-day DIY event in history! On 11/8/14, thousands of DIY-ers will gather for a fun-filled day of sewing and crafting classes taught online by leading bloggers and educational experts. It’s all about Connecting. Crafting. And Creating. 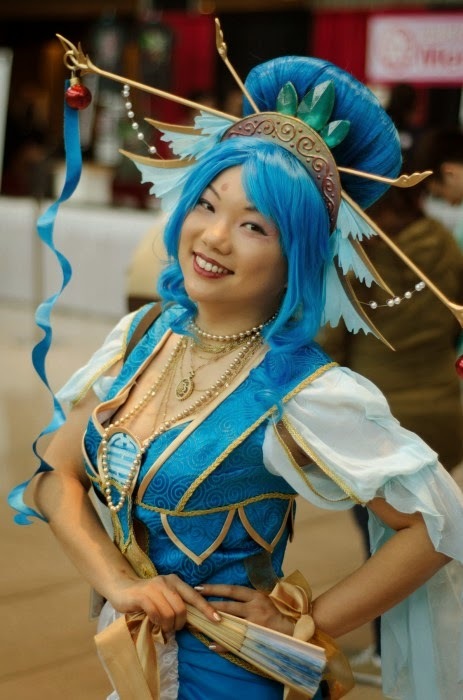 I will explore the world of Cosplay costuming and hold live Q&A after with all attendees! 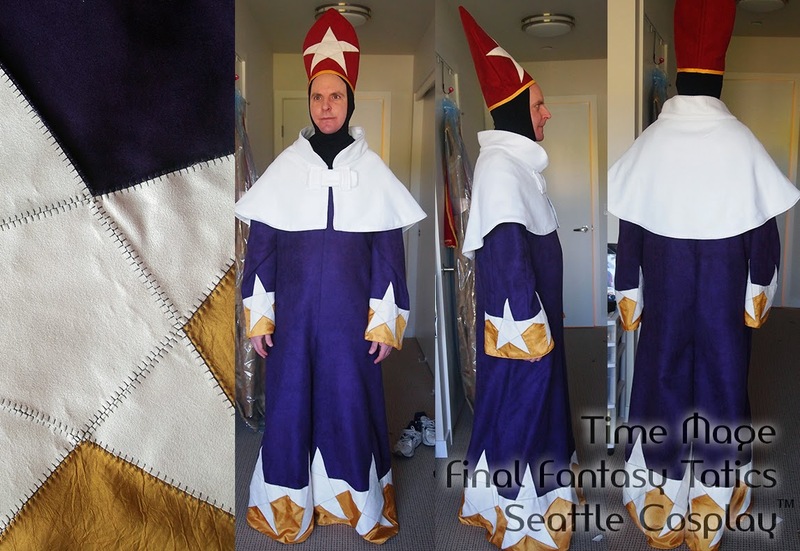 Last year, Amy and her husband Jeff came to me with a request to do the FFT White Mage and Laguna Loire’s cosplay. This year they tasked me with creating the Time Mage for Jeff. I already have Jeff’s basic measurements, so I got to work right away. The time mage like a bazillion stars, which is not a hard task. But then after looking at the design sketch for a bit, I get the feeling that this needs to have a very hand crafted feel to it. Almost like a heirloom quality. So instead of cutting out stars, I cut out various sizes of Triangles and Pentagons that made up the different sizes of stars. 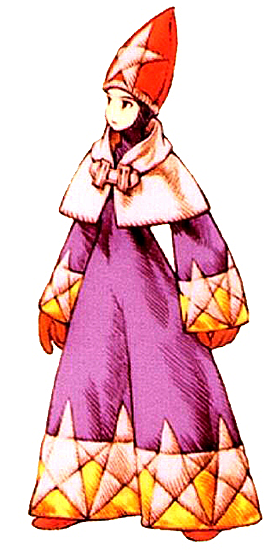 I also come to the conclusion that the time mage costume is a pant suit, caplet, black Habit, and the pointy hat. 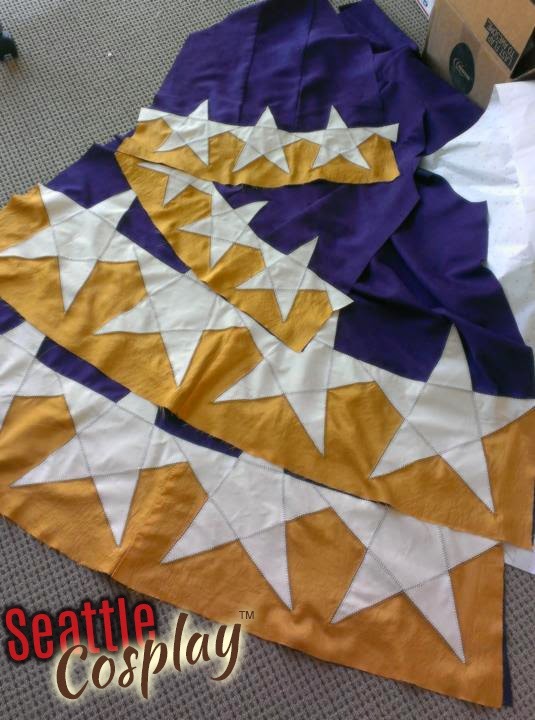 Here are the panels with freshly sewn stars! 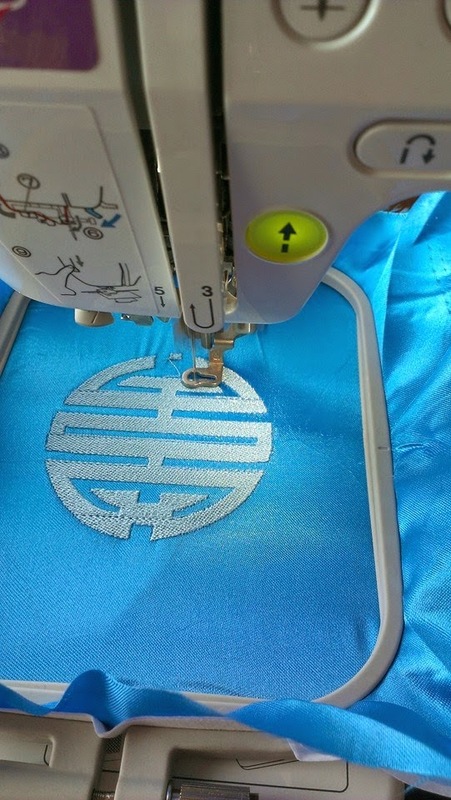 I love this heirloom stitch on my machine and I want to use it more on my future cosplays. I used mostly ultra suede for the stars, micro suede for the rest of the body and hat. I used a lofty white, low pile fur for the cap, and also used a similar heirloom stitch on the edges. Here is the finished look. 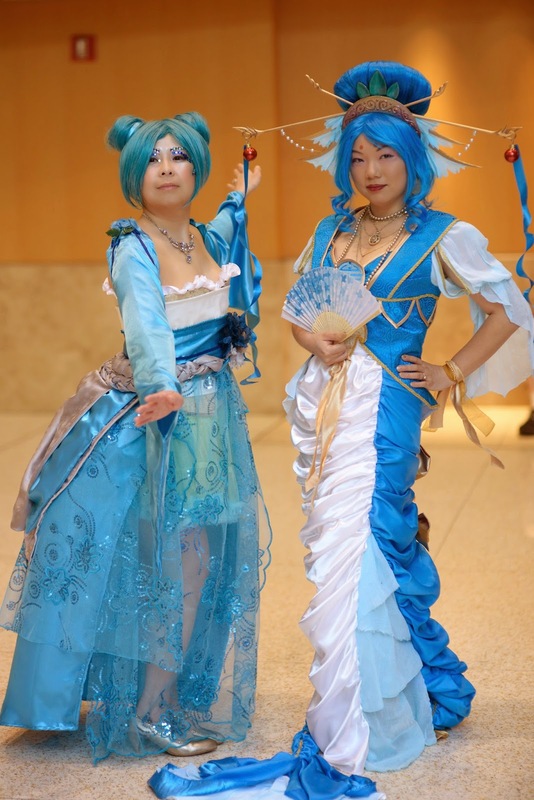 I love the fact that they are husband and wife team cosplaying mages together! I was a fan of the Pokémon anime series growing up. And as soon as I saw Cowslip's Pokemon Gijinkas, I wanted to make a cosplay base on it. 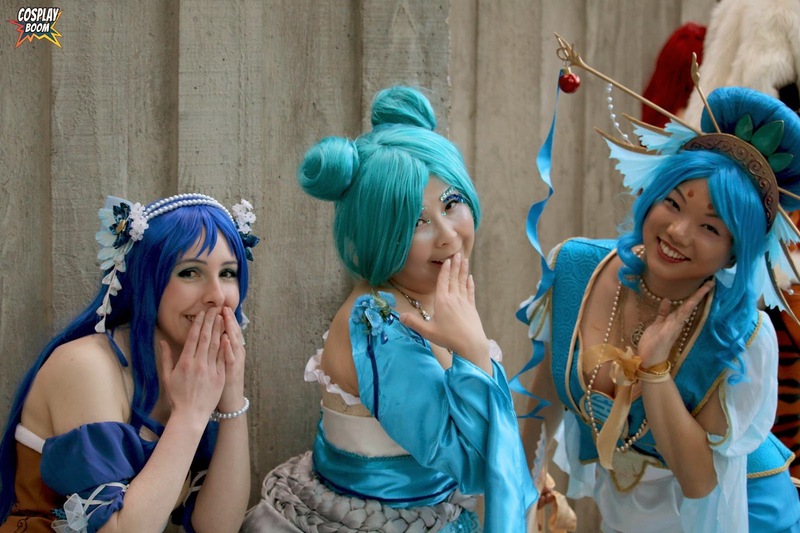 But being the only one may be hard to notice, so I rally up my friends to take part in a cosplaying group of Pokemon! 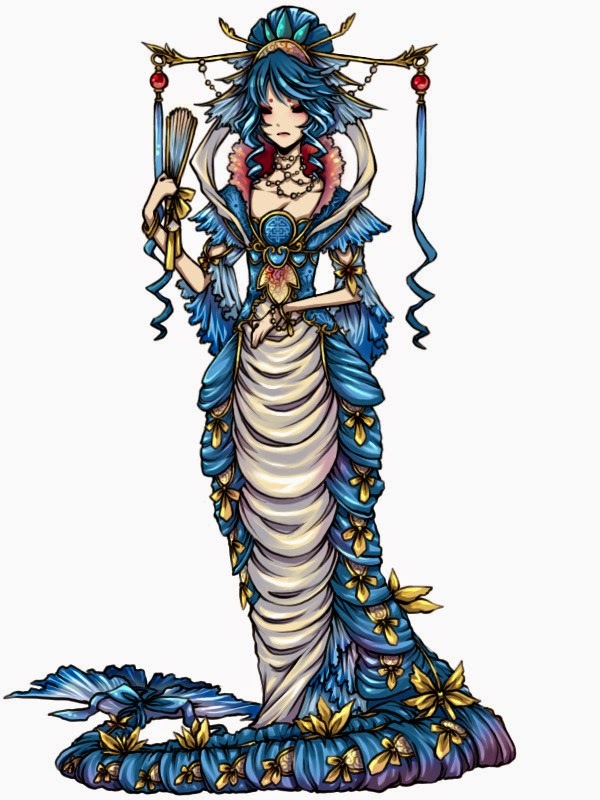 I picked Gyarados because of the design’s elegant nature and honesty, who doesn't want a big blue wig!? My friends and I went fabric + trim shopping together, and it was so much fun! 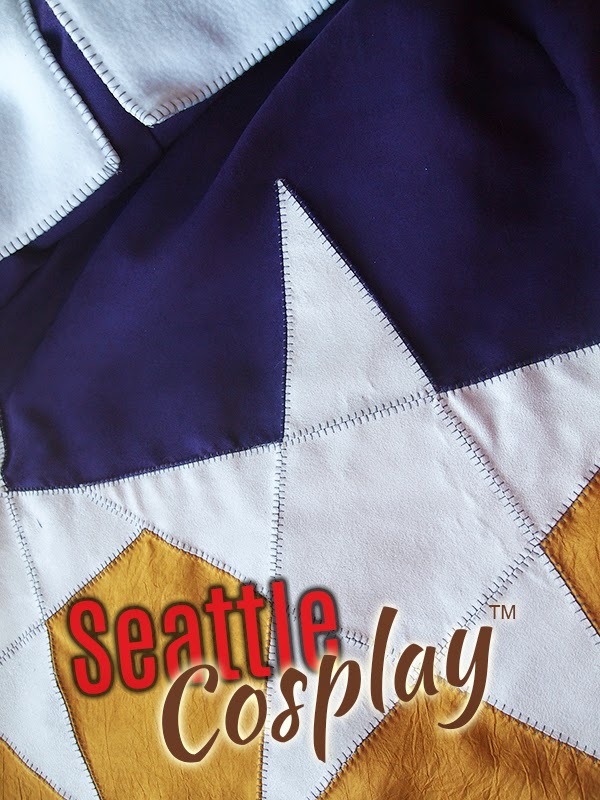 For the first time in my cosplay, I also digitized the center medallion. It was a fun and unique patch, which I don’t think I could have mimicked any other way. 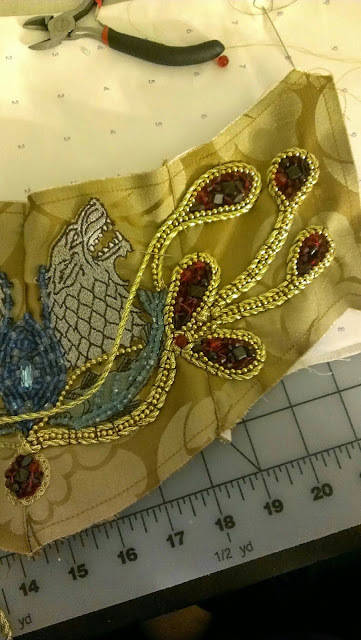 I used a blue on blue brocade, white and blue charmuse, boning for tail structure, and a ton of gold trims and robes I had left over from the Sansa cosplay. 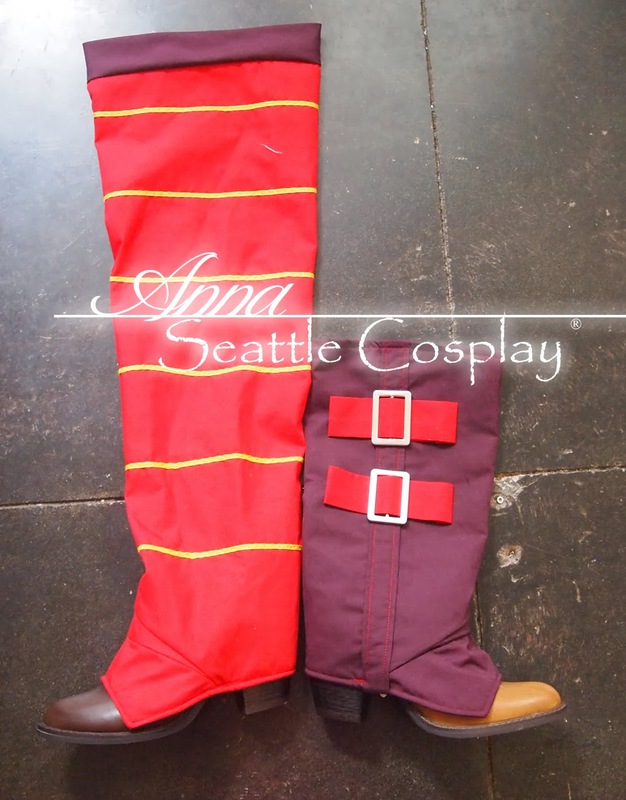 When I was draping the patterns, I can’t help but noticed the similarity of this cosplay and the wizard. It certainly brings back memories. Because of work schedule, I had to really crush the process, so I didn't take a lot of pictures in progress. But here are the finished photos. Hillary made and styled the wig for me, she also made the accessories in exchange for pattern making and draping lessons. I am all for that. There are still tons more work and details that needs to be added soon! 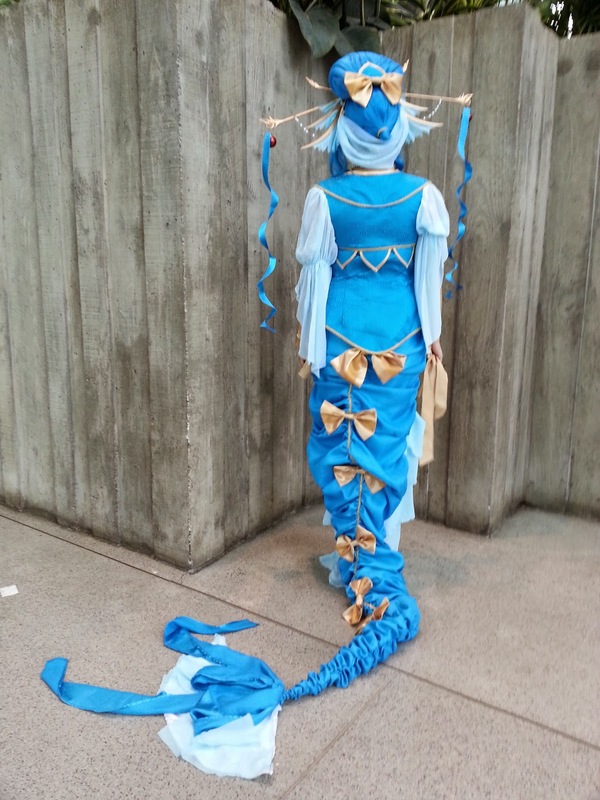 This last picture features Hillary (http://direshrimp.tumblr.com/) as Wartortle, Alli (https://www.facebook.com/PerzephoneCosplay) as Lapras. 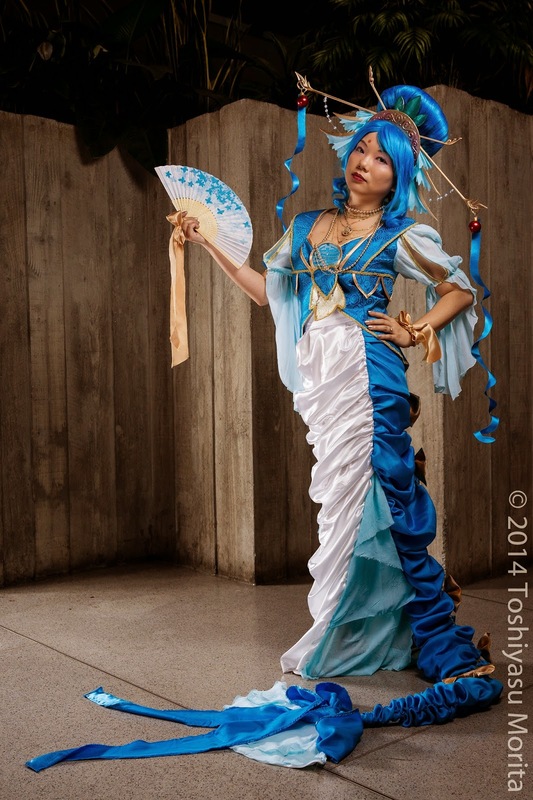 Thanks for Photos taken by Cosplay Boom, Toshiyasu Morita, my friends! I had been watching GoT since season 1, and read all the books soon after. The character Sansa Stark/Lannister has been a constant inspiration. I think her resilience and ability to cope with the plight life has thrown her is admirable. She is not the most outwardly strong character, nor is she most pretty; however, her quiet resiliency is what will keep her strong. Being in a POV character in the book lets us see through her eyes of the worlds crudity, and the actress (Sophia Turner) really completes the image for me. In Season 3/book 3, Sansa, almost materializing marriage to the handsome Loras, and was forced to marry Tyrion. In her mind, all she ever wanted is to marry a gallant knight. 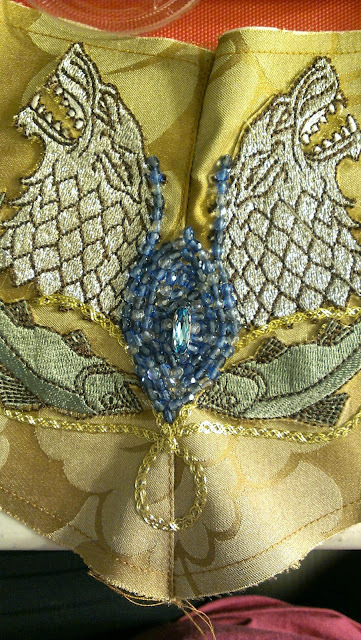 In the TV show, her wedding gown was full of meaningful details (THANK YOU Costume Designers and Master Embroiderers!). 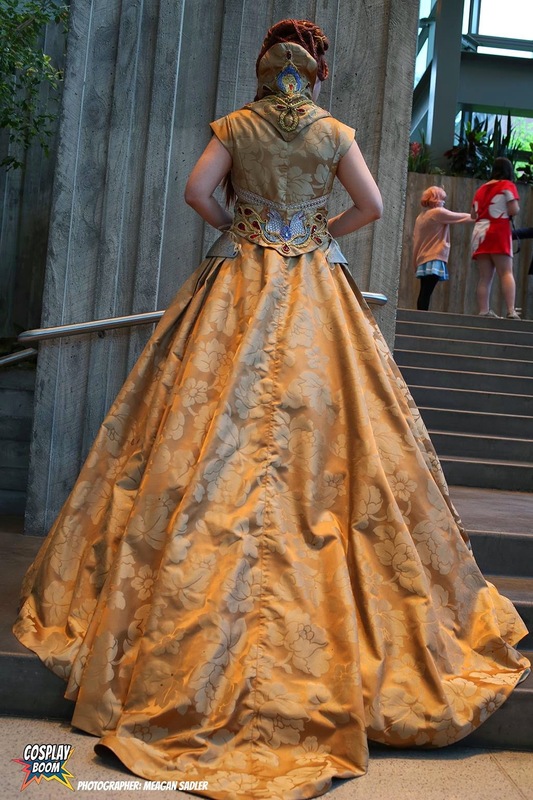 In a full gown with luminous gold fabric, she has her arms exposed with just two small piece of hip armor to accentuate her womanhood and vulnerable nature. 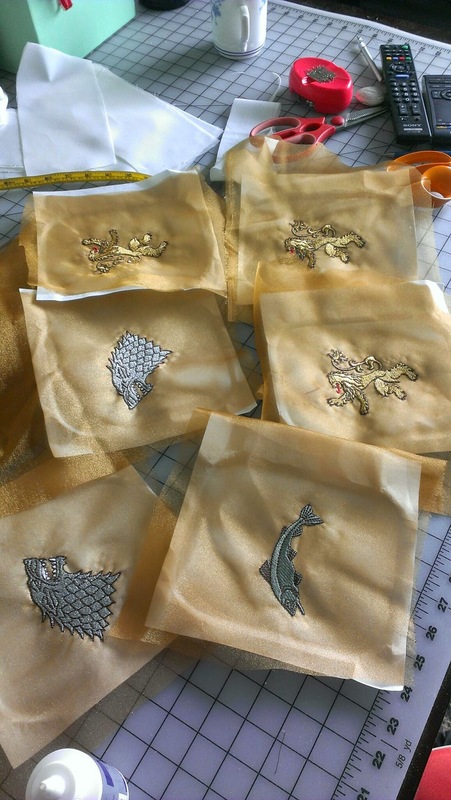 The scrolling pattern on the armor is the same as the ones on Cersei’s corset. Amidst all the design elements, the neck wrap is the piece that tells the story of her life. 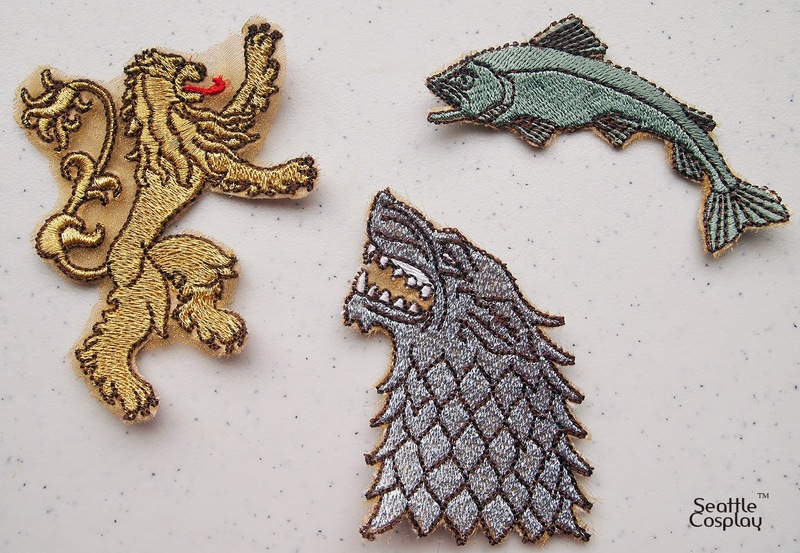 It starts at the lower center back, we see the Sansa’s origins with the union of Stark wolves and Tully fish. As the story moves forward, her arrival with at the kings landing and the elements of the Lannister lion slowly takes over. 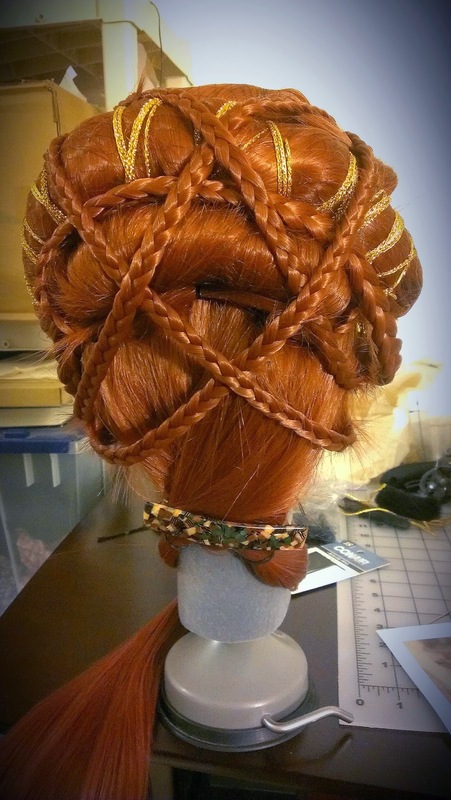 And at the highest center back neck wrap, we see the Lannister lion takes center stage and totally controlling her. Classical symbolism of a balanced pomegranate, flowers and water, and the background filled with gold beads are all present. For my construction, I made a fish tail petticoat ( longer at the back side, but nearly flat at the front) with stiff crinoline. 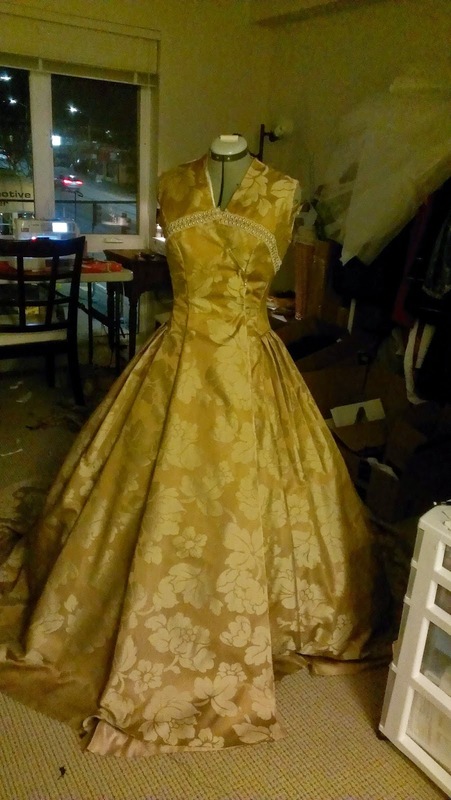 I made this before I started draping to make sure I can my dress accompanies the exact fullness. 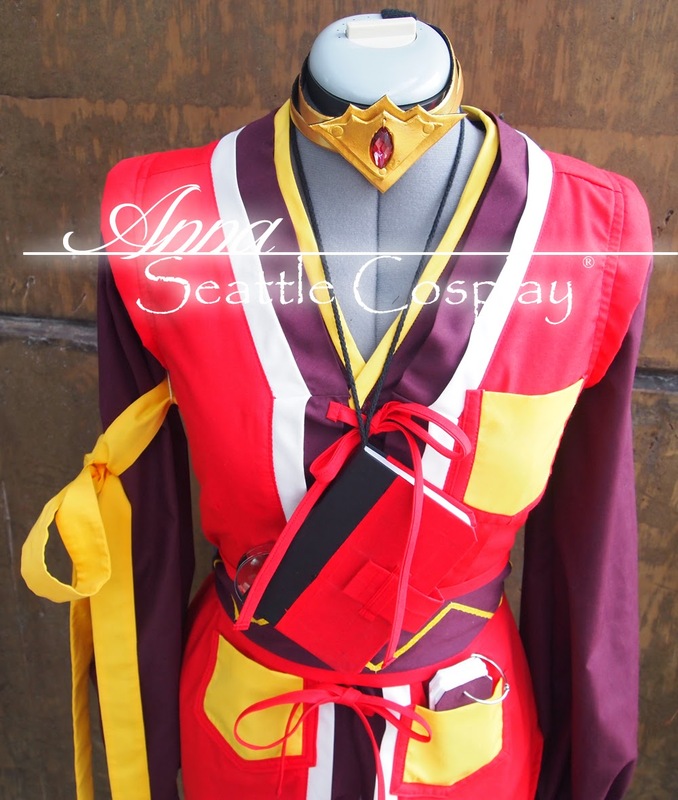 In the end I am glad I did this, because the fabric was becoming scarce. I had purchase 10 yards of 60” wide upholstery fabric, and used up 90% of it. 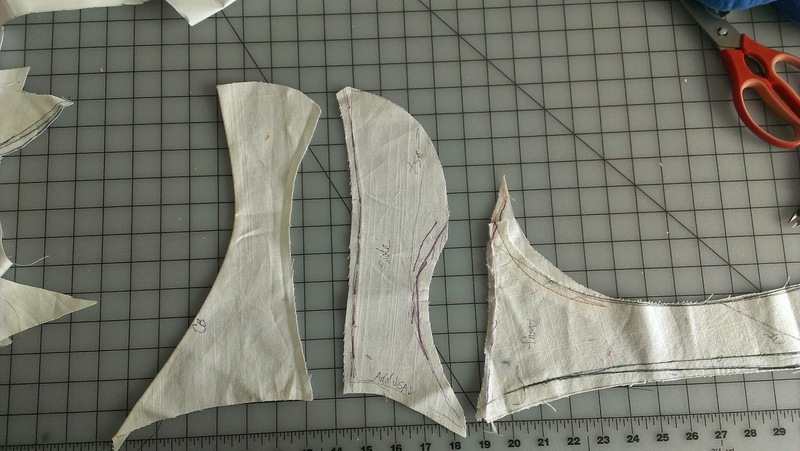 To start, I used hem tapes to outline the general shape of the top, noting the pleats at the side. 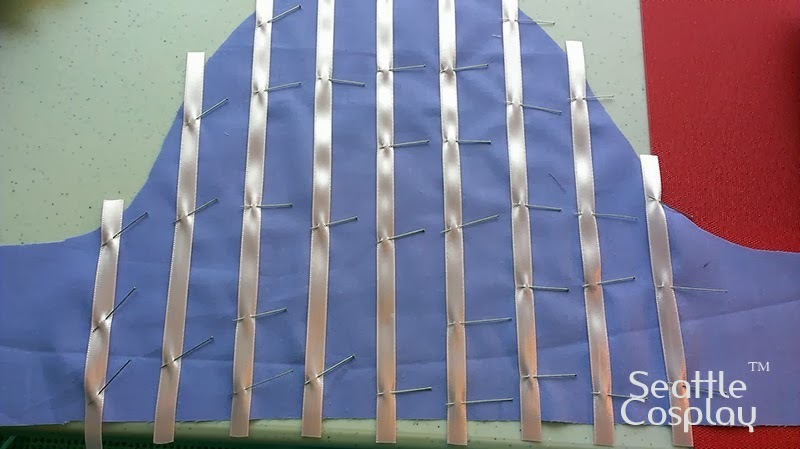 I used flat pattern techniques to make the neck wrap. For the neck wrap, I took extreme care to make multiple revisions until the shape is correct for it to blossom around my neck. 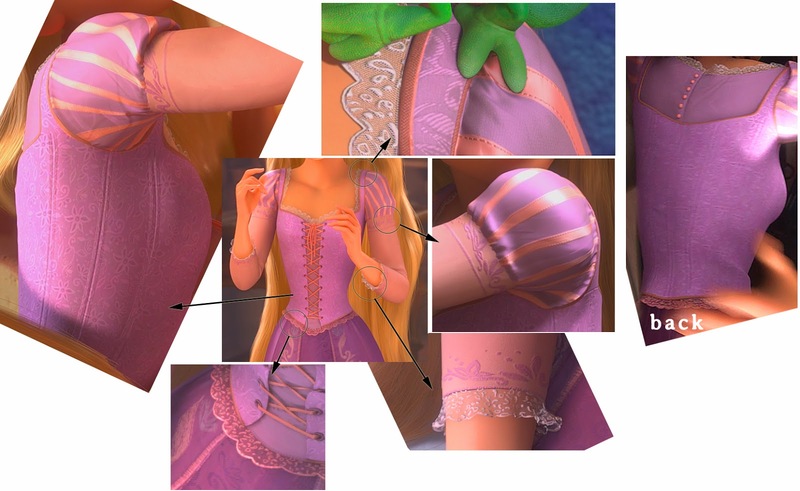 I also enlarged some screen captures to full size so that I can draft the embroidery lay out better. This is the base pattern for the neck wrap, if you want to reference it. :) the grid board on the back gives you a sense of scale if you want to duplicate your own. Left side is the center back, then side back, and Right piece is the front wrap. The curved Center back seam allow it to fit closely to the neck, and blossoms out, framing the head. 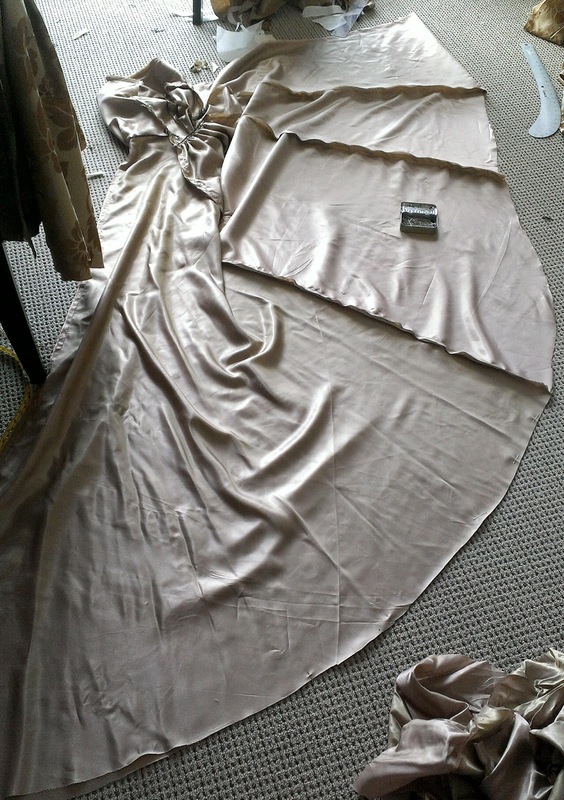 This fabric sew like a dream and I found a shimmery gold taffeta lining to go with the look. 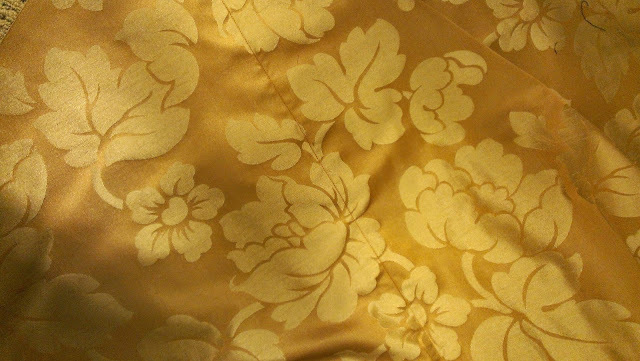 I also match the fabric pattern at all the center back seams, so the exquisite floral brocade was kept in tack! 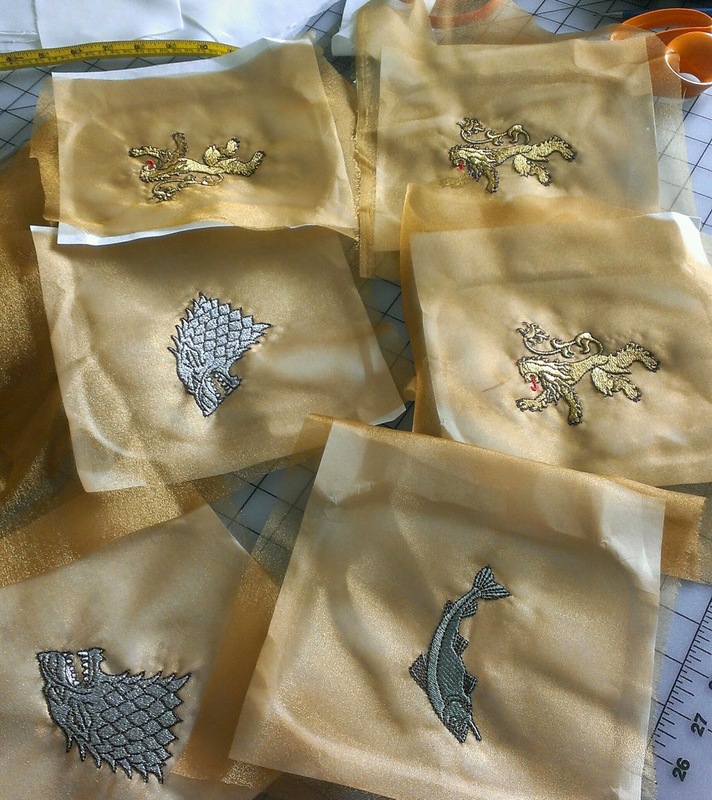 If you are interested in knowing my embroidery process, here it is. 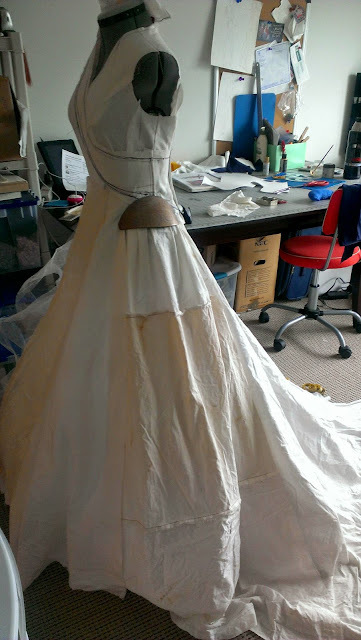 1) roughly place the major components on the fabric base first. 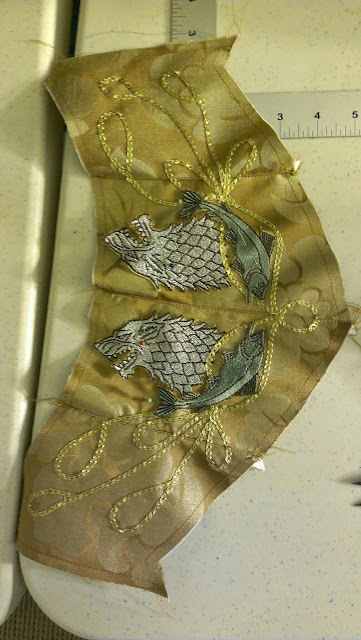 For the back panel, it would be the wolf and fish appliques. 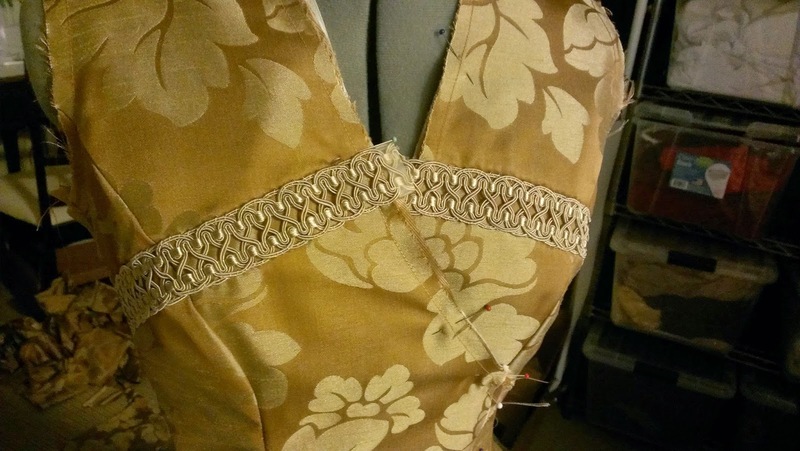 2) Use fine gold braided lace trims, I outline the secondary compoents. That would be the vines, flowers and pomegranates. 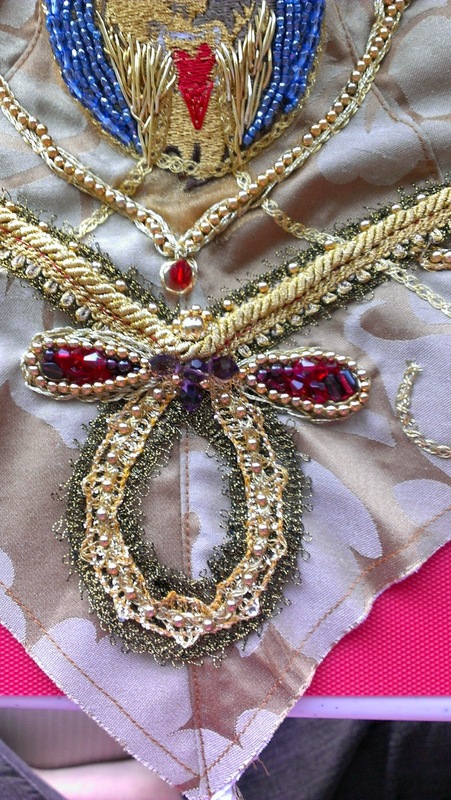 3) add beads and embellishments, to fill in the shapes, and attach major components. 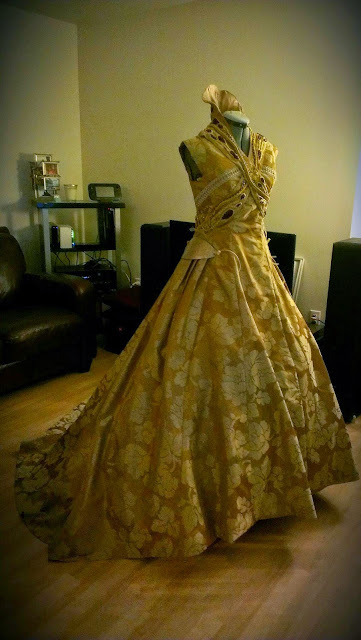 4) add thicker golden robes and laces to outline and stablize the design. 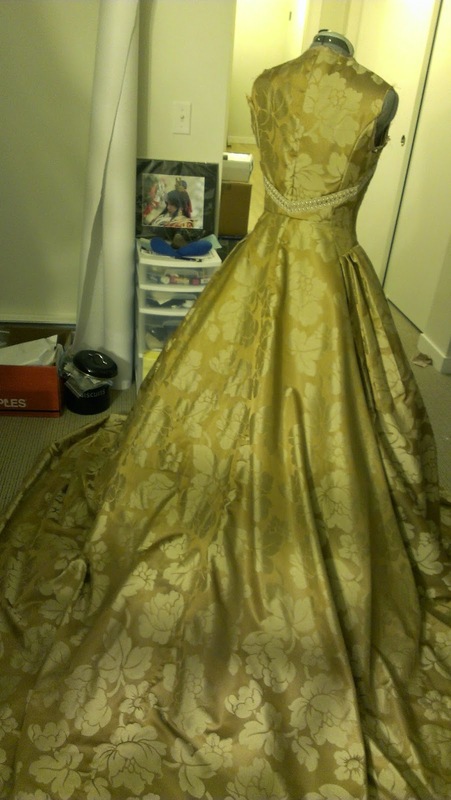 5) lastly (not shown, is to add all over gold beads. The night before ECCC, I lay out the whole set up and totally ready to go! 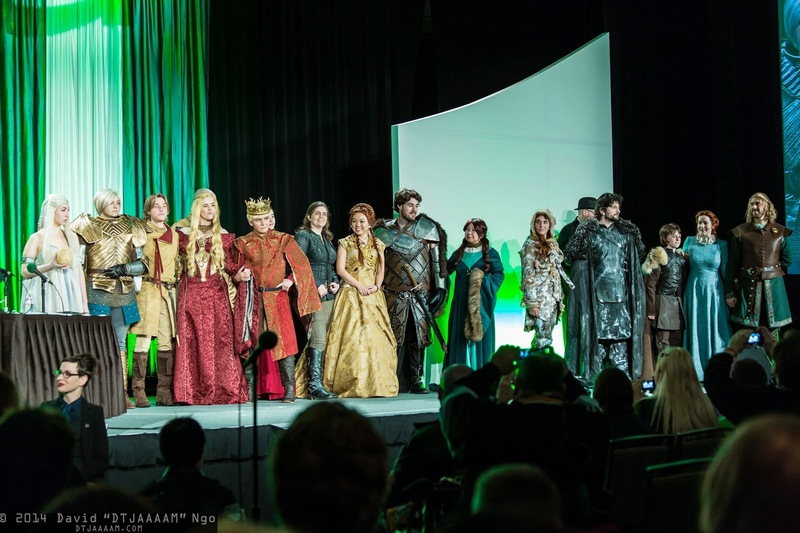 At ECCC, I had so much fun hanging out with my GoT group of 14 people, and won the best group catalogry in the competition! Below photos are taken by many awesome photographers and thank you all!! 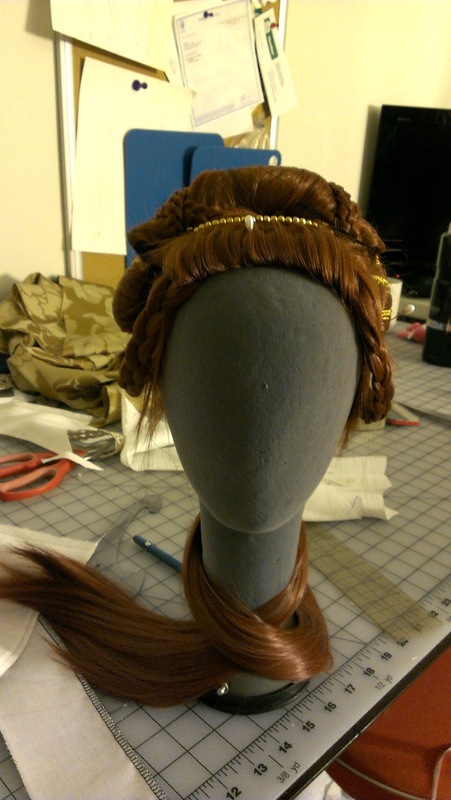 First cosplay commission of my new year is Rapunzel from the Disney animated film Tangled! 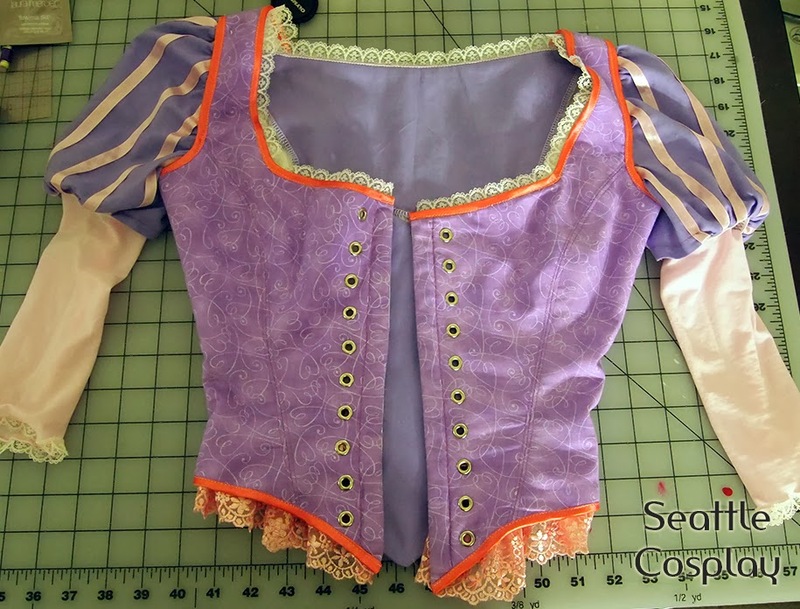 This is for a partial commission project where Hillary only wanted me to make her corset. 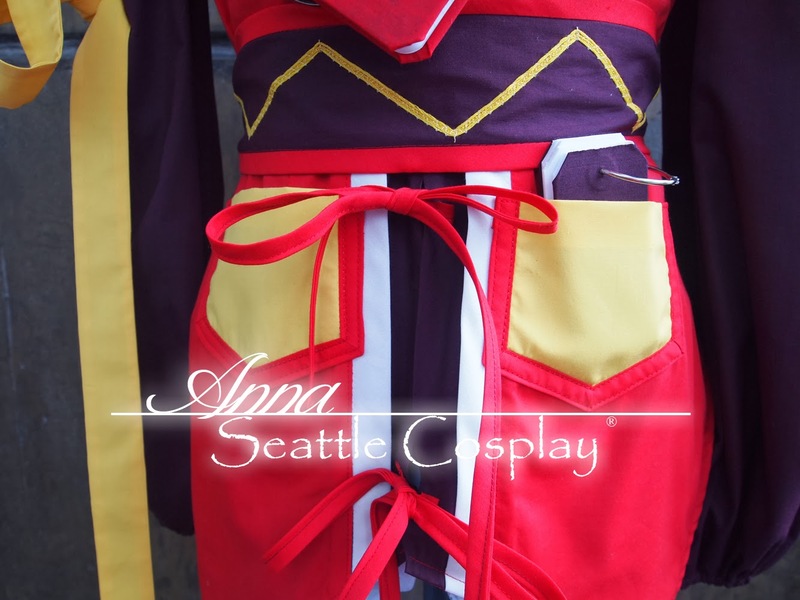 We used a soft cotton fabric to capture the perfect hue of the character's costume. 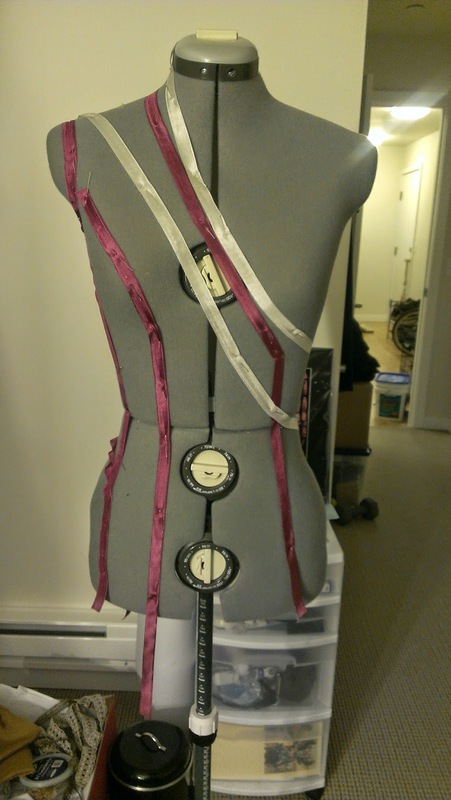 Mostly out of cotton material, I made a steel boned corset with detachable sleeves. The edge binding is a pretty orange with slight color saturation, and of course finished with layers of ruffled lace. I finally have a logo! 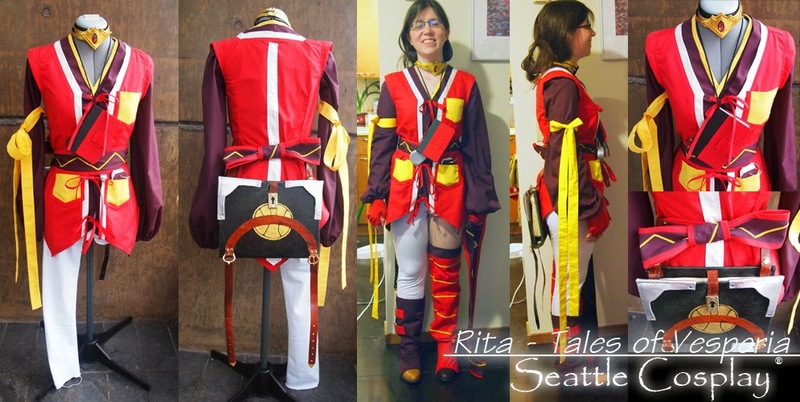 One of the biggest project I did for Pax Prime 2013 was Rita Mordio from Tales of Vasperia. My customer wanted a complete package, which included everything you see - costume, accessories, shoes covers, gadgets! And Rita has many! From her mysteries waist gadgets to the waist book harness, and her weapon - a flying scroll, Rita is endless surprises and discoveries. But I took it with stride, dissecting the figurine (which my customer kindly provided) piece by piece one at a time. I used Kona cottons for that deep saturated color effect to achieve the bold look of Rita's cosplay. Of course Kona Cotton also offers a bazzillion colors that matches my every needs! 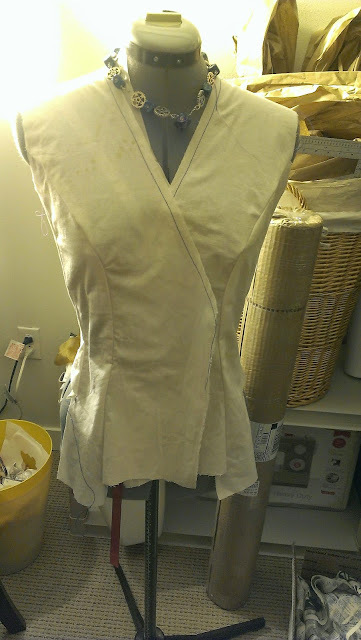 I made the inner bodice with long puffy sleeves, and then the outer vest. Of course they are tacked together for consistency and ease of wearing. The legging is just a simple white cotton knit with one leg, and covers are created to fit the shoes. 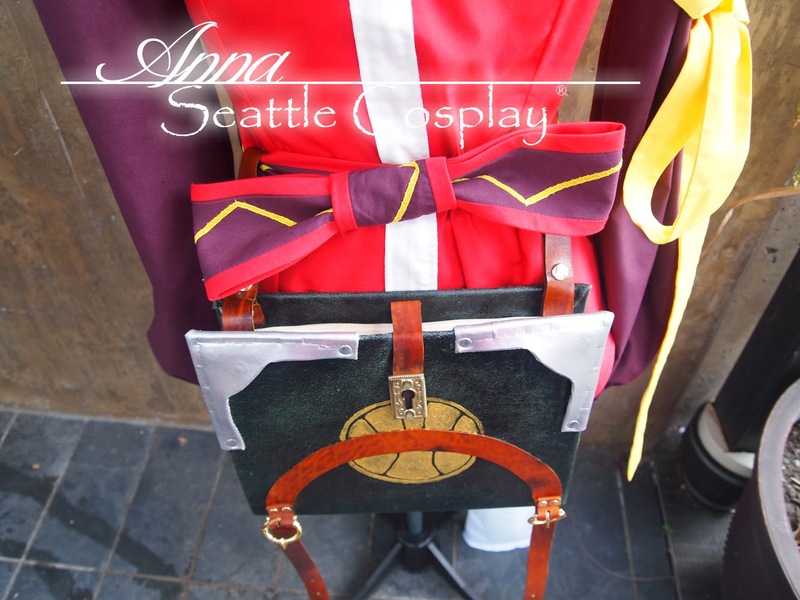 I also partnered up with a leatherworker to make the golden choker, book harness with storage space inside for Rita's Convention loots. I am very happy with how this complicated but amazing project turned out!